Serving cuisine inspired by French and British flavours, The Restaurant offers the perfect escape from city life, where intimate seating areas reflect the comforts of home. Aside to the contemporary interiors and twenty-four-hour service, The Restaurant also provides distinctive spaces such as the Lounge, Library, Dining Room, Living Room, Kitchen or the Gallery to retreat to, whether for breakfast, lunch or dinner. 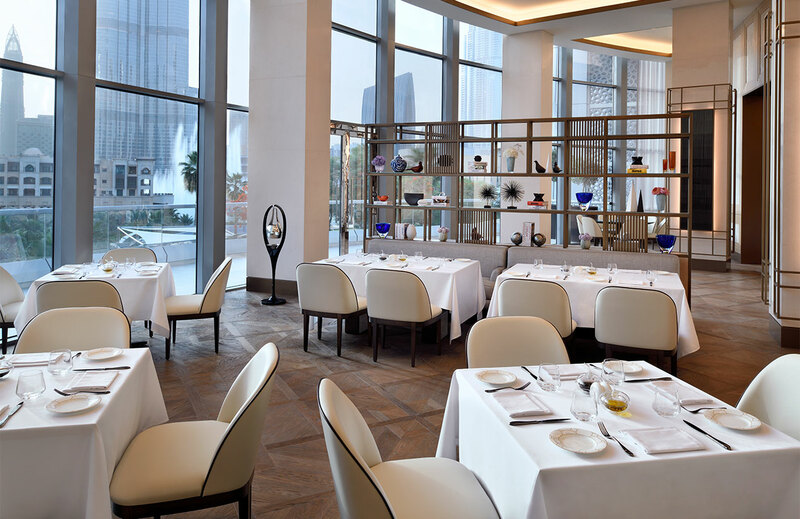 View Burj Khalifa and Downtown Dubai in all their glory, as well as stunning vistas of The Dubai Fountain, matched only by the sumptuous menu. An enchanting terrace provides the perfect viewpoint to watch the show while overlooking the hotel’s secret gardens and cascading swimming pool. After an indulgent meal, retire to The Library for post-dinner beverages and enjoy signature tastes recommended by the resident sommelier. The Restaurant at Address Downtown truly is the intersection of style, comfort and unforgettable flavour.